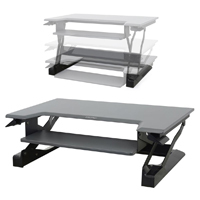 The WorkFit-S clamps on to the front edge of your desk and uses the Ergotron's Constant Force spring lift mechanism to assist in moving the keyboard tray, upper worksurface and monitor through the range of motion. The overall vertical adjustment range is 18", and the monitor mount can be independently adjusted through an additional 4.8" range. The mounting surface must be between .47" and 2.4" thick for the clamp to function, and the monitor must be between 6 and 16 lbs for the LCD pivot (10° down to 20° up) to function correctly. The keyboard tray is 27" wide x 9" deep x 0.25" high, can adjust to a 7.5° negative inclination, and can support a maximum weight of 5 lbs. It can be mounted at 3 different depths which provides a 3" range of adjustment and in addition can also be positioned to either the right or left in order to centrally position the keyboard in front of the monitor. The upper worksurface is 23" wide x 15" deep x 0.25" high, with a maximum load capacity of 5 lbs. The LD version is designed to support monitor sizes up to 24" diagonal and between 6 and 16 lbs. Total combined weight load (including Worksurface, Keyboard and Monitor loads) should not exceed 18 lbs. For monitor sizes larger than 24" diagonal or total weight loads greater than 18 lbs. the HD version of this product may be an option. NOTE: It is recommended to strengthen the mounting point to prevent damage to the desktop. 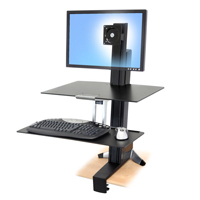 The WorkFit-S clamps on to the front edge of your desk and uses the Ergotron's Constant Force spring lift mechanism to assist in moving the keyboard tray, upper worksurface and monitor through the range of motion. The vertical adjustment range is 18", and the monitor mount supports independent vertical adjustment through an additional 4.8" range. The mounting surface must be between .47" and 2.4" thick for the clamp to function, and the monitor must be between 16 and 28 lbs for the LCD pivot (10° down to 20° up) to function correctly. The keyboard tray is 27" wide x 9" deep x 0.25" high, can adjust to a 7.5° negative inclination, and can support a maximum weight of 5 lbs. It can be mounted at 3 different depths which provides a 3" range of adjustment and in addition can also be positioned to either the right or left in order to centrally position the keyboard in front of the monitor. The upper worksurface is 23" wide x 15" deep x 0.25" high, with a maximum load capacity of 5 lbs. This HD model is designed to accommodate monitor sizes up to 30" and weighing between 16 and 28 lbs can handle a maximum combined weight load (including monitor, worksurface and keyboard loads) of 29 lbs. 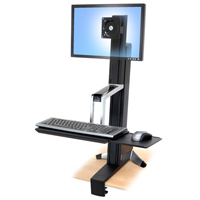 The WorkFit-S clamps onto the front edge of a standard desk and uses the Ergotron's Constant Force spring lift mechanism to assist in moving the keyboard tray, upper worksurface and monitor through the range of motion. The overall vertical adjustment range is 18", and the monitor mount can be independently adjusted through an additional 4.8" range. The mounting surface must be between .47" and 2.4" thick for the clamp to function, and the monitors must be between 6 and 14 lbs (no greater than 28 lbs total). 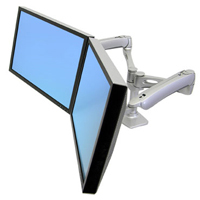 For optimum viewing comfort monitors can be deployed at a 3° or 8° upward angle. The keyboard tray is 27" wide x 9" deep x 0.25" high, can adjust to a 7.5° negative inclination, and can support a maximum weight of 5 lbs. It can be mounted at 3 different depths which provides a 3" range of adjustment and in addition can also be positioned to either the right or left in order to centrally position the keyboard in front of the monitors. The upper worksurface is 23" wide x 15" deep x 0.25" high, with a maximum load capacity of 5 lbs. The Dual version is designed to support monitor sizes up to 24.5" physical width and between 6 & 14 lbs. Total combined weight load (including Worksurface, Keyboard and Monitor loads) should not exceed 25 lbs. 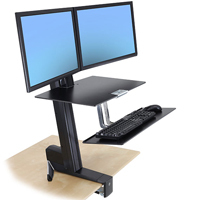 The Workfit-T Sit-Stand Desktop Workstation from Ergotron converts any stationary desk into a sit-stand desk. This fully pre-assembled unit is ready to be used right out of the box and requires no assembly. It has a small enough footprint to fit on most workstations and still has a large enough worksurface (35" x 25") to accommodate up to 2 monitors (with stands) and other office items, such as documents, calculators, etc. The height-adjustable mechanism of the Workfit-T is designed to move the worksurface and keyboard straight up or down, unlike other designs which force the user back as the platform elevates. This design also helps make the unit more stable, especially at the higher settings. The keyboard tray is 25" wide by 9" deep and is situated 4.5" below the worksurface. The Workfit-T can handle weights up to 35 lbs and has a lift range of 15". Attaching the LX Notebook Tray to a suitable monitor arm enables notebook and laptop users to position their monitor at the height and location which best suits their needs. A non-slip pad and adjustable clips will accommodate stable mounting of virtually any size of portable computer. Easy access to connection ports ensures quick connection with or without a docking station when arriving at or leaving the office. The LX Notebook Tray is equipped to be mounted to any 75mm VESA compatible monitor mount with the included mounting hardware. NOTE: The 2.25 pound weight must be added to the laptop (and docking station) weight when determining the total weight load for monitor arm selection. Each monitor can be between 7 and 20 lbs, notebook between 2.5 and 12 lbs, max combined weight is 40 lbs. 13" of lift. 12" tall pole. Includes Notebook mount accessory. Comes with desk clamp and grommet mount. The Neo-Flex HD Wall Mount Swing Arm from Ergotron offers a flexible alternative to rigid wall mounts for displays weighing up to 50 lbs (23 kg). Embedded CF technology ('constant force' springs) enables effortless screen adjustment for optimal viewing comfort. The rock-solid construction secures your display investment, while pleasing aesthetics make it perfect for the home or office. The arm comes with an integrated tilt lock-down feature and easily istalls in three steps. 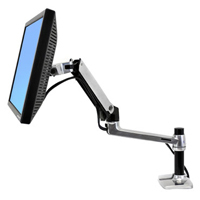 The LX Desk Mount LCD Arm from Ergotron allows a fully adjustable configuration that lifts your LCD screen up to where it is easier to see while reclaiming valuable worksurface. Made of durable polished aluminum, the 45-241-026 allows you to reposition your LCD with just a touch (up, down, forward, and back), providing unparalleled range of motion. Save time by using multiple applications at once - eliminate toggling back and forth between documents and programs. 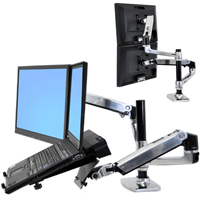 The LX Dual Side-by-Side Arm from Ergotron allows a fully adjustable side-by-side configuration that lifts both LCD screens up to where they are easier to see while reclaiming valuable worksurface. 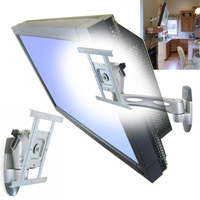 Made of durable polished aluminum, the 45-245-026 allows you to reposition your LCDs with just a touch (up, down, forward, and back), providing unparalleled range of motion. Save time by using multiple applications at once - eliminate toggling back and forth between documents and programs. 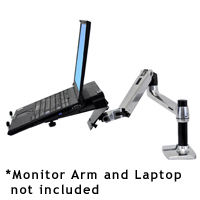 NOTE: We strongly recommend getting the LX Dual Stacking Arm instead, since the latter also has two arms but has more height adjustment and includes the optional notebook mount accessory, all for the same price. The WorkFit-S clamps on to the front edge of your desk and uses the Ergotron's Constant Force spring lift mechanism to assist in moving the keyboard tray and monitor through the range of motion. The vertical adjustment range is 18", and the monitor mount independently can vertically adjust an additional 5". The desk edge must be between .47" and 2.4" thick for the clamp to function, and the monitor must be between 6 and 16 lbs for the LCD pivot to function correctly. The keyboard tray is 16.5" wide x 9.3" deep, and the slide-out mousing surface is 7.5" wide x 7.9" deep, and the maximum weight on the keyboard surface cannot exceed 3 lbs.